A shortened version of this story appeared in The New York Times’ college sports blog The Quad and in The Daily print edition today. Luck strides across the Radio City Music Hall stage in a dark-blue suit and a tie with lilac and lavender stripes, his normally shaggy hair groomed for the occasion. He bear-hugs the league commissioner and flashes a goofy smile for the rows of cameras. 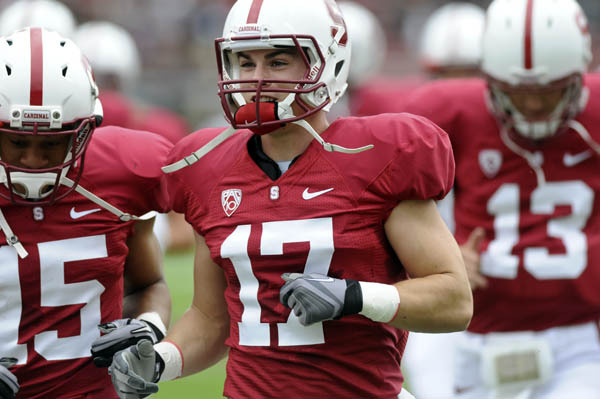 Back at Stanford, in the Rains apartment he shares with Luck, Griff Whalen is also beaming. Staring at the 36-inch TV in the corner of their living room, he watches as the kid from Houston that he’s known since freshman year talks to Deion Sanders on ESPN. It’s early in the evening on Thursday, April 26, and Whalen has a math midterm at 7. He sits on a couch with Luck’s girlfriend, anxiously reviewing his math notes while glancing at the TV. Whalen has been roommates with Luck and David DeCastro, Stanford’s All-American guard who would also be drafted in the first round, for the past three years. He doesn’t want to leave before DeCastro is selected, but 7 p.m. quickly approaches. So, in his standard shorts and T-shirt attire, he shoulders his backpack and drives across campus to the Hewlett building. There, dozens of students, many oblivious to the NFL, file in for their linear algebra and vector calculus test. On this day, much more than their wardrobes and the 3,000 miles between Palo Alto and Manhattan separate Whalen from his best friend. For Luck, and even for DeCastro, the draft is both a coronation of a blue-chip college career and the road to riches. For Whalen, who has been advised that he’s a late-round pick at best, it is a reminder that life after football could come sooner than he’d prefer. Two days later — after teammates Coby Fleener, a tight end, and Jonathan Martin, a tackle, become early second-round picks — Luck is back in their Rains apartment. He’s eager to see where Whalen will end up. The quarterback sits alone because his favorite receiver, the quiet senior from Sylvania, Ohio, is holed up with family in a nearby hotel room. It’s Saturday, April 28, the final — and longest — day of the draft. Eight Stanford players remain on the board, each hoping to hear his name called. Some, like wide receiver Chris Owusu, came to the Farm as highly touted recruits. Whalen has a much more interesting story. A high school football and lacrosse star at Southview High School in Sylvania, Whalen looked for colleges where he could play both sports. After narrowing his focus to football, he weighed “preferred walk-on” offers from Ohio State, Syracuse, Toledo and other schools in the Midwest versus a similar offer from second-year head coach Jim Harbaugh at Stanford, coming off a 4-8 season. A preferred walk-on spot is college football purgatory. Nothing is guaranteed — no playing time or scholarship, and certainly no glory — except a roster spot and a chance to move up. Whalen accepted Harbaugh’s offer and joined a recruiting class that included zero five-star recruits, denoting the highest-caliber players, and only two four-star recruits: Luck and Owusu. Little did Whalen know, Luck would become his best friend. 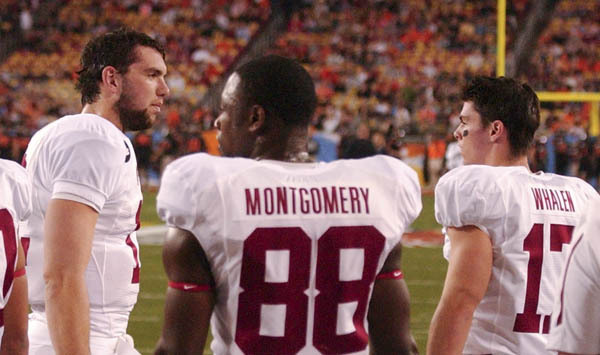 Only a few days after arriving on campus in summer 2008, coaches told Whalen that they wanted to move him from safety to running back, a position ravaged by injuries. A few months later, Whalen nervously approached Harbaugh and asked to move to wide receiver, his third position since arriving on the Farm. Whalen, barely six feet tall, had never played wide receiver. But he was mentally tough and impressed teammates and coaches with his consistency, going all-out in every practice. On Nov. 1, 2008, the Cardinal was up big over Washington State, cruising to what would be a 58-0 victory. Special teams coach D.J. Durkin approached Whalen on the sidelines. “Uhh, yeah,” he replied, his eyes growing wide. Whalen had not expected to be in the game at all but later even played receiver in the blowout victory. Called a “backyard athlete” by his friends, Whalen has a knack for picking up any sport and quickly mastering it. Part of his rare athleticism may be attributed to good genes — his great-uncle is Hall of Fame pitcher Tom Seaver. One day in the spring of his sophomore year, he was out playing catch on the lacrosse fields with Bart Thompson, a friend who had played for a rival high school in Ohio. The legendarily gruff Harbaugh, now coaching the San Francisco 49ers, allowed Whalen to play for the club lacrosse team. The product design major would get up early for football weightlifting, go to a full day of engineering classes and then do conditioning and workouts with the lacrosse team — sometimes after a second football workout in the afternoon. He improved his route running and hit the weight room harder than ever that offseason; following in the footsteps of Ryan Whalen, he earned a scholarship during training camp, right before his junior season began. During his junior season, Whalen caught 17 passes for 249 yards and one score. After that season, Baldwin and Ryan Whalen left for the NFL, leaving wide receiver spots open. Finally, it was Whalen and Owusu’s time to lead. The coaches track all players throughout the offseason in various athletic tests. That summer, Whalen outworked everyone in the program. Pep Hamilton, Shaw’s replacement as wide receivers coach when Shaw was promoted, compares Whalen’s quickness, ability to create separation from defenders and on-field awareness to Wayne Chrebet’s. Hamilton coached Chrebet on the New York Jets, where Chrebet had a highly successful 11-year NFL career. The hard work paid off and Whalen earned a starting spot alongside Owusu for their senior season. He caught 56 passes for 749 yards and four touchdowns, including notching the best game of his career in the Cardinal’s biggest matchup of the year against then-No. 7 Oregon Ducks. Whalen hauled in 9 passes for 107 yards and two scores in a brutal 53-30 loss that knocked Stanford out of national title contention. There’s no doubt coaches love Whalen’s work ethic, but in a league of stopwatches and eye-popping workout numbers, work ethic is often thrown into a mystery box of “intangibles.” What NFL team would value Whalen’s consistency and work ethic the most? One of his mentors, Ryan Whalen, was selected in the sixth round by the Cincinnati Bengals, while another, Baldwin, went undrafted and signed with the Seattle Seahawks. Where would Griff Whalen land? Back in the Palo Alto hotel room with his family, Whalen sees that Owusu hasn’t been drafted yet either. Whalen waits. So do his friends and teammates. Text conversations turn from anticipatory to worried and from worried to bleak. Eventually, he resigns himself to being an undrafted player. Minutes after the draft ends, the Colts call to offer a three-year free agent contract. The offer is a chance to reunite him with Luck and Fleener, if he can make the team. Other teams call later on, but his mind is made up. Why would he go anywhere else? A few hours later, the draft madness has ended, and the Cardinal teammates are texting and calling each other, all excitedly discussing where they wound up. All in all, 12 of them signed with NFL teams over the weekend. Three of them — receiver Chris Owusu, defensive end Matt Masifilo and safety Michael Thomas — elect to sign with their former coach in San Francisco. Three others — Luck, Fleener and Whalen — head to Indianapolis to reboot a struggling franchise, much like they did at Stanford. The Thursday morning after the draft, Fleener, Luck and Whalen board a flight to Indianapolis. They have gone on trips for the past four years, but always for Stanford road games and always as peers. They arrive at the Colts facility and walk through hallways adorned with pictures of former players and coaches — even a picture of coach Harbaugh from his days as a Colts quarterback. Luck faces a microphone or camera every time the media are given a chance. And almost every article pays a sentence or two to mention the little-known undrafted receiver joining him from Stanford. They spend three days in Indianapolis meeting new teammates, with whom they will battle for jobs, talking to coaches and trying to soak up as much information as possible. 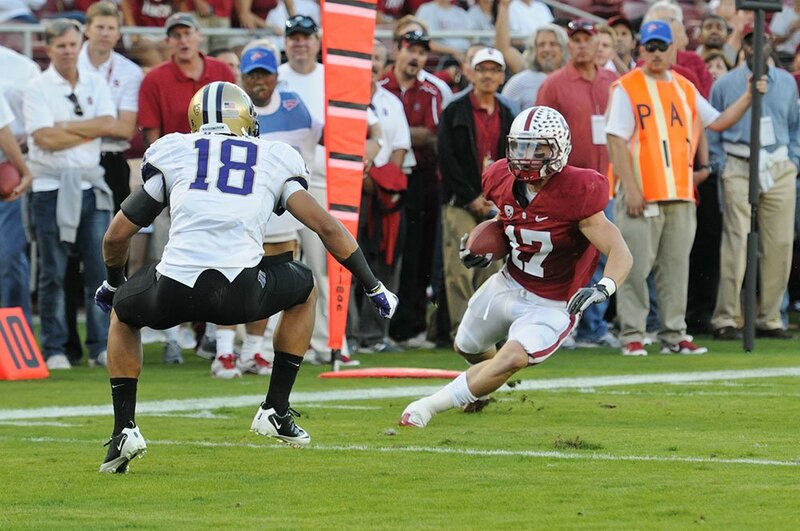 For Whalen, it was like his first days at Stanford all over again. Except then he was guaranteed a roster spot. Under NFL rules, players still taking classes cannot participate in the 10-day organized team activities (OTAs). For the Colts, that means Luck, Whalen and Ohio wide receiver LaVon Brazill need to stay away. Fleener, a fifth year who is earning a graduate degree, is exempt from the rule, as he has finished his undergraduate work. For Whalen, it does not bode well that he is missing one of the rare opportunities to make an impression on coaches. However, he has a major advantage over the other wide receivers. While they’re playing catch with less-heralded quarterbacks in Indianapolis, Whalen will be working out with Luck at Stanford. The roommates return to Palo Alto, their heads stuffed with new information, just in time for another round of midterm exams. But now they have a whole host of other things to study: the intricacies of the Colts offense. On an unusually windy Friday morning, three weeks after rookie minicamp, Whalen meets up with Luck and cornerback Johnson Bademosi, who recently signed with the Cleveland Browns, on an empty practice field on campus. Their classmates are busy in class, in the library or sleeping in after Thursday’s senior pub night. Fleener joins them on the field, complaining about Luck calling him too late the night before. He’s still on Indianapolis time, he explains. They all don Stanford gear, except for Luck’s white Colts hat. Fleener and Luck play catch and joke as they warm up. Whalen stretches and runs quick sprints nearby with a scowl-like focus. Luck warms up more by throwing routes to Whalen and Bademosi. Several balls sail past Bademosi or miss him; on every throw the ball seems to drop into Whalen’s hands perfectly. Only one throw appears a bit off target. Whalen extends his right hand and pulls it in easily. “Its like one and one,” Bademosi says, talking about Whalen and Luck’s chemistry. They practice the route three more times before moving on. Fleener and Luck tower over Whalen as they circle up in a miniature huddle to discuss a play. Whalen’s preparation shines through as he discusses terminology with Luck. Luck takes a snap and drops back. Whalen comes out of his stance hard, breaks crisply and sprints past Bademosi, snagging the perfect ball out of the air. “Did you think I could’ve gone like one deeper or was that good?” he says, panting as he jogs back. “No, I liked that,” Luck responds. The three discuss Colts practices, which Fleener can attend, but Luck and Whalen are relegated to watching on tape. “Who’s done with school?” Fleener mocks, raising his hand and looking at Luck and Whalen. Luck and Fleener joke between plays. Whalen barely speaks if it isn’t about a route or play. “That was perfect,” Luck says after a throw to Fleener. “That’s what she said,” Fleener retorts. Whalen and Luck wrap up their final exams on June 8 before flying to Indianapolis the next day for a week of minicamp. The next Friday, June 15, they return to Stanford for Commencement. They barely have time to say goodbye to friends, classmates and teammates before flying right back to Indianapolis for more minicamp. Luck, DeCastro and Whalen leave behind three years of living together, and four of competing and taking classes. 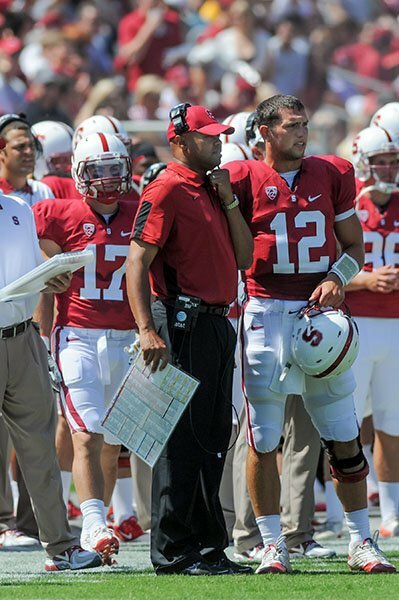 The casual observer will notice that they leave Stanford with three straight bowl appearances, two BCS bowls and a No. 4 ranking in their senior season. But they also leave behind a host of memories not seen by the public: the football team’s ultra-competitive soccer games with the national champion women’s soccer team, swimming in the Luck family’s nearby pool and cracking jokes in the California sunshine, eating casual dinners with fellow senior and pro golfer Michelle Wie, their neighbor last year, and basking together in their muted on-campus celebrity and watching “House,” “South Park” and “Modern Family” in their living room. Luck’s immediate future is clear-cut. He’ll be trying to step into the shoes of one of the greatest quarterbacks of all time, Peyton Manning. Whalen’s future is much more tenuous. He moves to a new city fighting to earn a job. And if that doesn’t work out, he’ll look for opportunities outside of football. The Colts signed 15 undrafted free agents, including Whalen. Most will be cut over the summer. The current roster stands at 85 players and needs to be pared down to 53 by the end of preseason, in late August. Whalen is one of 10 receivers on the list; most teams only take six, maybe seven into the season. He will have to impress on special teams and outwork other rookies and journeyman receivers to make the roster. Luck isn’t the type of person to use his clout to suggest Colts management give Whalen a spot. Whalen isn’t the kind to ask for a helping hand. Billy Gallagher is a senior staff writer at The Stanford Daily. He has previously worked at The Daily as editor in chief, a managing editor of news, news desk editor, sports desk editor and staff development editor. He is a junior from Villanova, PA majoring in Economics. He is also a writer for TechCrunch.